I'm under the impression that people settle on an all-time favorite movie at a relatively early age. With time they become increasingly difficult to displace, no matter what cinematic greatness may follow. This is what best describes my experience with "Jaws" (1975). Eventually I may have acquired a greater admiration for "The Godfather" films but by then it was too late. My first viewing of "Jaws" felt perfect. I later learned it wasn't. It turns out some features from that period were edited here in Mexico as to fit them for a "G" rating. That meant getting a much abbreviated version of the cage duel the first time around (why censors picked that scene in particular, I'll never understand). I can also remember them darkening the images of the attack on the first victim as to make them more palatable for younger viewers. After dozens of later viewings on several formats, watching the newly restored Blu-ray version will likely represent my first time watching the film as Spielberg originally intended it to look. The movie deals with a series of shark attacks at the seaside community of Amity. Roy Scheider plays Police Chief Martin Brody, the everyman responsible for public safety. His first reaction is to close the beaches but his superiors deny him, fearing the impact to the businesses to which they "owe their very lives". Brody is joined by oceanographer Matt Hooper (Richard Dreyfuss) and together they team with colorful but intimidating Quint (Robert Shaw) in hopes of doing away with the beast. As the events unfold, things grow increasingly complicated and the men find themselves well over their heads, each forced into their own hand-to-hand battle with the creature. Peter Benchley wrote the bestseller on which the movie was based. He framed his shark story with some complex human relationships and a dead-serious tone. A good portion of the book was spent dealing with Brody's wife and her affair with Matt Hooper, the same man who would eventually be shot and killed by Martin while trying to save him from the monster's jaws. Filming a literate translation of the novel would have likely distracted the audience from the core theme and contributed little. Fortunately, Spielberg was always aware "Jaws" should first and foremost be an adventure thriller, driven by three-dimensional characters. At the center of the movie is Chief Brody. His phobias and concerns make him the one character everybody can identify with. The two other men are also essential in their own ways. Hooper helps us grasp the scientific explanations behind the event, and the humor that derives from his kinetic nature helps the journey remain enjoyable throughout the increasing tension. Quint is often just as likable as the other two protagonists and his unpredictability never lets the audience get too comfortable. Shaw's screen-presence (especially during his "nails on blackboard" introduction and legendary "USS Indianapolis" speech) is the one element that would seem harder to replicate should a new version of "Jaws" ever be made. It is ironic that in a "monster" feature like this, it should be a speech (about a series of unrelated shark attacks in WW2) that best evokes horror and does it exclusively through sublime dialogue and acting. The key factor behind the movie working so well was Spielberg's ability to make his creature's presence felt from the first frame as the camera becomes its own POW, thanks in no small measure to John Williams' legendary score (from its very first note as well). As a result, there's not a single moment when we feel safe from a sudden scare. This set the stage for Spielberg to take over and basically spend two hours toying with audience, always mindful of the precise moments when our guards were somewhat lowered. Case in point is the terrific chumming sequence between Roy Scheider and the monster, a moment that tells you everything there is to know about his instincts and sense of timing, even from an early age (viewers, who've never watched this scene with an audience, are yet to fully appreciate the film's impact). "Jaws" is the kind of feature where you are conscious that you are being manipulated into having certain reactions every step of the way and you still can't help but admire the craft behind this. It's surprising to realize that if every scene where we see the shark in "Jaws" were to be assembled together, they wouldn't add up to more than 2-3 minutes (the vast majority coming at the very end). This brings to mind the controversy derived from Anthony Hopkins' Oscar win as Best Actor in "The Silence of the Lambs" some years ago as his appearance there lasted only 20 minutes and made some believe he should have been nominated in a supporting category instead. The presence of the great movie characters can be felt from beginning to end, no matter how brief. 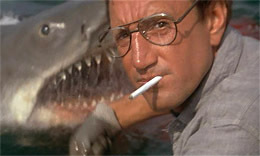 Later features have unintentionally provided a good idea on what "Jaws" would have been under Spielberg's original plan, with twice as many scenes involving the shark. Think for example, how little excitement was generated by the endless shark attacks in "Jaws 2" and its unremarkable characters. The same applied to the radically different "Hannibal " with the title protagonist, free from the restraints of his cell, appearing in most every scene of that picture. In "Jaws", after much teasing of his monster's colossal capabilities (mostly through the results of its acts) Spielberg kept his promise and delivered a memorable creature in the right doses. "Jaws" makes for an invaluable tool in understanding what makes a thriller great. Two factors weighed heavily on the picture's success: Spielberg's decision to shoot it in the open seas and his mechanical shark's infamous malfunctions (this contraption was named Bruce, after Spielberg's lawyer). The filming is widely considered one of the most arduous ever as circumstances forced the director to make it with basically smoke and mirrors. This doesn't mean the results should be attributed to luck. "Jaws" would have never achieved its potential without a filmmaker keenly aware on people's primal fears and the way to play into them. His patience in showing the beast at only the right times, his understanding on the effect of placing the camera at sea level (where we can't see what's going-on below), the painstakingly steps he took to place the three heroes in a claustrophobic solitude (another positive variation from Benchley's novel). All these elements served a specific purpose and without them, the film would have never been the same. When "Jaws" first came out much was made about "Bruce's" alleged lack of realism but it seems to me that by choosing to use him selectively and in the real environment, this is clearly not an issue when it comes to the film's effectiveness. Think in contrast of the creatures that later populated " Deep Blue Sea "(1999): the impact from their terrific animatronic versions, was mostly lost by overstaying their welcome; the unbelievably movements in fake water mostly brought unintentional laughs. After watching "Jaws" we are reminded there's no real substitute for an actual being swimming in the real ocean. We now take for granted that the entire movie was shot on location but, how many recent features have gone to such extremes, whatever their budget? With "Jaws" Spileberg basically created a pre-"Terminator" movie (not unlike that in his previous feature "Duel"). More than just an animal, his protagonist is a semi-unstoppable force that could only be brought down with a freakish and spectacular event. The picture takes its liberties when depicting our heroes failing to do much damage to the creature with firearms. I know little about real sharks or guns but I have to guess that no matter how big and powerful, a beast like this could have never taken more than a few bullets before dying (the film would have then lasted about 80 minutes, tops). Benchley's original ending had the shark succumbing to Quint's harpoons just a few feet before reaching Chief Brody, but Spielberg opted for the exploding scuba-tank finale instead, fully aware that the novel's conclusion would have never fit with the rest of the picture he had made up to that point. As discussed in a previous FFC essay, it's hard to deny that a remake of "Jaws" would become a hit. This raises the question of whether there would be another director willing to endure what it takes to produce such a film the right way. Watching the phenomenal progress of the animatronic sharks in "Deep Blue Sea " left me little doubt that a new "Bruce" would look great to the point where not many filmmakers would resist the temptation of limiting its appearance to only the few, appropriate moments. All of this would likely be superfluous as well. After all these years and several dozen viewings, "Jaws" still has the feel of a relatively new movie with little room for improvement. It represents one of the great communal and involving cinematic experiences. Sadly, it is no longer available to be seen in a big screen with an audience. This picture doesn't need a remake but a theatrical re-release instead. "Jaws" is well known as the first of the summer blockbusters but it was its worthiness that helped discover this seasonal niche for opening certain features, and not the other way around. This is something that the countless second-tier-comic-book-inspired flicks of today would have never achieved. The film makes for the best sort of horror picture; the kind that makes an audience go crazy at the theater but still allow for them to leave it in high spirits. Every aspect about the movie worked at top level and to quote Matt Hooper: "this was not a (boating) accident" but the direct result of each and every one of Spielberg's decisions, paying off. Dire circumstances required an enormous amount of on-site writing and improvisation, forcing him to constantly dig from deep within as to come up with the right way to tell this story. Whatever feelings he may have about the movie, this makes it one of his most personal ones.